Spring is just around the corner, that is if you consider Sunday a corner. But you'd never know it from the weather we've had this week. The "biggest storm of the season" turned out to be about 5" of snow that transformed into 3" of heavy slush once the rain came into the mix. The town plows turned that into a thick wall of ice that took us over an hour to clear. We're getting more snow today, but it doesn't look like it's going to stick. Yesterday I worked from home and had a great run on the treadmill. I've definitely made my peace with the machine, but I far prefer running outside. 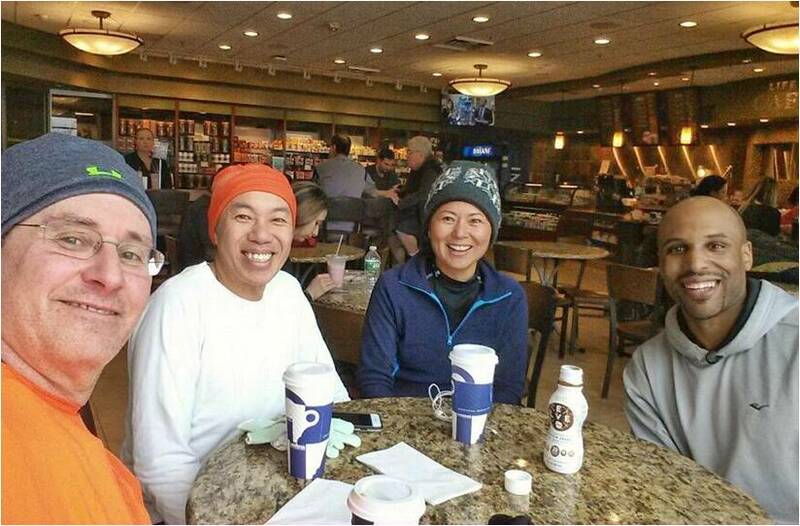 This morning I participated in the Syosset Life Time group run that is led by Runsketeer SIOR. I was looking forward to running outside for the first time since late February and excited to see my buddies. We missed TPP who had to work today, but we were joined by a great guy (AA) who fit right into our group. The plan was to meet at Life Time Fitness at 9:00 AM, but SIOR and KWL, who are training for Boston, were finishing up their "pre-run" at SUNY OW and were running to the gym from there. AA and I arrived at 9:00 and, after we met, I told him that our run leader was on her way. That gave us about 30 minutes to chat before SIOR and KWL arrived. After quick introductions and a hydration stop for SIOR and KWL, we were off. My Garmin had a little trouble acquiring a GPS signal but our bossypants run leader had us running through the lot and into the adjacent neighborhood before I could start recording my data. I finally began capturing distance, pace and HR after going half a mile. SIOR and AA took the lead and KWL and I followed. Even after running 14 miles earlier (they ended up doing 18 miles today), KWL and SIOR were still raring to go and I appreciated that he hung back with me. Although KWL was taking it easy, I was actually running 84% of max heart rate which resulted in a pace in the high 10:00 range. I never felt overworked but did fade a little close to the end. I managed to spring back enough to finish the last quarter mile in the 9:00 range. Once we'd all arrived at the gym, we made the decision to break tradition and have coffee at Life Time's café rather than Starbucks. It was a perfect place to cool down with plenty of space and good coffee. 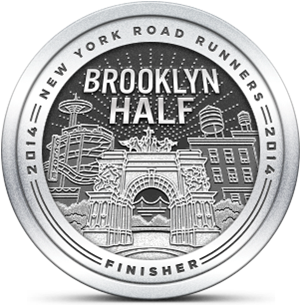 It turned out that AA is an experienced marathoner and he has done three of the US majors (Chicago, NYC and Boston). KWL has done NYC, Berlin, London and Tokyo and will add Boston to the list in April. SIOR has done Boston, Philly, and a couple of others and is on track to meet her NYRR 9+1 to gain entry into NYC next year. I'm not in their league but I have done three halfs. I'm thinking of doing one race this year to see if I'm ready to return to competition. One other positive today, besides getting to run and hang out with three great people, is that my plantar fasciitis seems to be abating. I ran in my Kaynos today and used the PF orthotics I bought a few weeks ago. No pain during the run and only mild soreness afterward. I'm hoping that conditions are okay for another outside run tomorrow, but if today's light snow makes for icy roads tomorrow, I'll be back on the treadmill. But as I said earlier, I'm good with that. 9+1 to qualify for 2018. When you say you plan on running one race this year, do you mean for the rest of 2017? Not to be a bossy pants or anything, but why not set shorter goals? One race for mid-summer, see how you do, then maybe another in the fall, and so on and so on. I'm typing this as I march into the dining room wearing glasses, a yellow turtle neck, and a ton of sass. Grab a cheese stick and help me find a good comeback race. I don't think a ten miler is the way to go since my base is about 3.5 these days. Now that the PF has reduced and spring is theoretically coming, I can try to train longer miles at Bethpage on weekends. Marcie Mazzola is in a couple of weeks. Do a couple of spring 5ks, then cow harbor in September. Marcie Mazzola was my first race (it was 4 miles then not 5K) and it would be a good one to come back to. Maybe. Cow Harbor is a lot to take on in my very untrained state, unless I'm willing to live with a very slow result. It's five months away. More than enough time to prepare. Dude, you could get ready for a marathon in six months. A 10k is a piece of cake. Yes, I've run a few. But I'm not the ER I once was, due to my advancing age (see any comment ever from SIOR to verify that fact). If you're running 3-5 miles regularly, you could run a 5k this Saturday. You could run a 10k next month. You're not planning on winning the race, so you don't need a six month training plan. New emojis were secretly introduced. Is there a bossy emoji? And if so does it look exactly like you? I can't run a 5K this weekend because it is Mrs. ER's birthday. And I can't run a 10K next month for a reason that I'll come up with by next month. I was actually doing my best to not come across bossy. I'm glad it worked.